One of the main objectives of the Festival is to develop an appreciation for cinema and to offer the opportunity to approach the main players to the Dominican audience. This is why the Festival pays public tribute to prominent figures of the world of films as a token of gratitude for their work and their contribution to different aspects of the industry. Join us in honoring them! 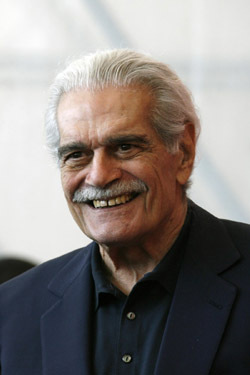 This III Edition of the DR Global Film Festival wants to honor one of the most representative and bright star of the film scene offering a tribute to the distinguished international actor Omar Sharif. Born Michel Demitri Shalhoub in Alexandria, Egypt, in 1932. Raised as a Roman Catholic. He graduated in Mathematics and Physics at Victoria College in Alexandria and Cairo University. After working in the family business he started his acting career in Egypt where soon became a household name. He married his partner on the screen, the Egyptian actress Faten Hamamain and converted to Islam taking the name Omar al-Sharif. The couple had one son, Tarek and, after their divorce in 1974, he never remarried. Bridge, horses and gambling were his passions since the 60s and for almost two decades co-wrote a syndicated bridge column for The Chicago Tribune. He’s also the author of several books on bridge and has a bridge computer game licensed under his name. During his extensive career in large international productions of world impact like Doctor Zhivago, Lawrence of Arabia (for which he was nominated for an Oscar) Genghis Khan or Funny Girl, directed by the masters David Lean, Anthony Mann, Henry Levin and William Wyler, as well as his work in other smaller, independent projects like Monsieur Hibrahim and the Flowers of Khoran (he was granted a Cesar Award,) The Rainbow Thief or the most recent, J’ai Oublié de te Dire , Omar Sharif has been able to present his powerful presence and charisma to the screen and has also given riveting, nuanced interpretations, always with the distinction of a big star so seldom found among actors. Omar Sharif is a man of his own, who goes by his particular book and who does unusual things like working in a film (Disparadme!) without receiving any compensation just for the fact that it is was shot in his preferred city, Naples, and because the script was about one of his favorite word, gentile. The tribute will take place at National Theater on Wednesday 18th, at 7:00pm.